I missed the 21K registration for the Run United 1 2014. No excuses. My mistake. I was hoping that the organizers will open additional slots but when I read the message from Runrio Inc's Facebook account, my United Medal goal for 2014 became unattainable even before reaching the start line. 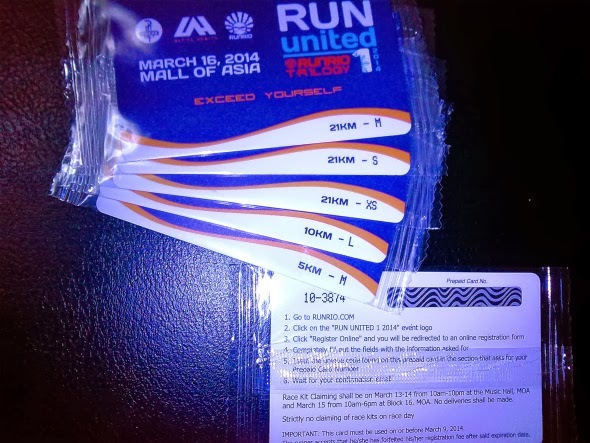 Then, I saw the post of Kulit Runner, the Run United 1 2014 Prepaid Cards Give-Away that led me to the Singing Dad on the run and joined the contest! Whether I will be picked or not, I can say that running bloggers like Kulit Runner and Singing Dad help make runner's shattered dreams whole again.